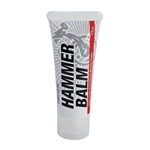 Hammer Balm is an all-natural muscle balm made with premium therapeutic ingredients like, ginger root, clove oil, and Arnica. A little Hammer Balm goes a very long way, so our one-ounce bottle offers much more relief than you might think at first. You can also try our quarter-ounce sample size, suitable for travel. If you spend much time at all on a bike, you know that one of the most important pieces of equipment you need is a cream that helps protect that particular area where "skin meets seat."